I wrote this some time ago, and I finally decided that it was time to share it with all of my friends on the Hub Pages. The beer can went through a lot of changes to get to where it is today. It didn't look anything like it did when it first was introduced. Can makers were experimenting with putting beer in beer cans way back before prohibition stated in 1919. In the late 1920s some of the major brewers were working on the idea of canning beer, even though they could only sell near beer at the time. 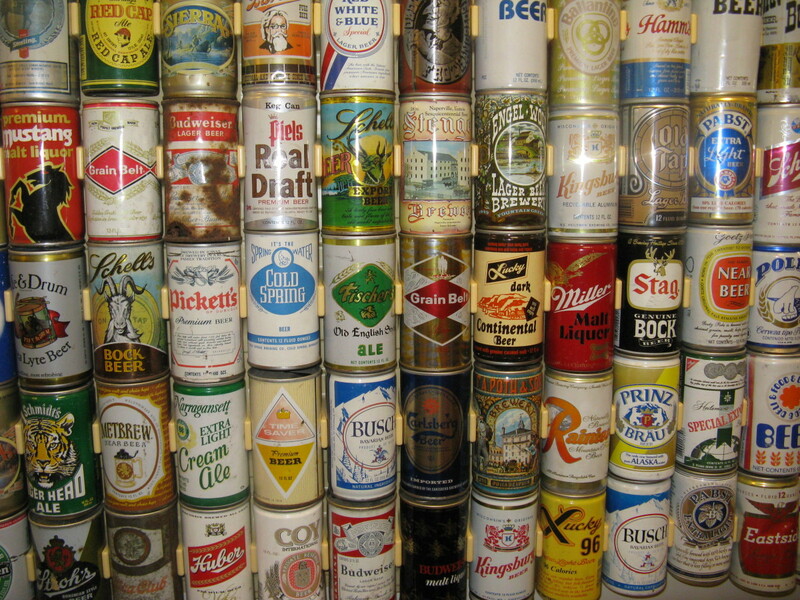 Looking at all of these old beer cans is certainly among fun things to do when your bored. 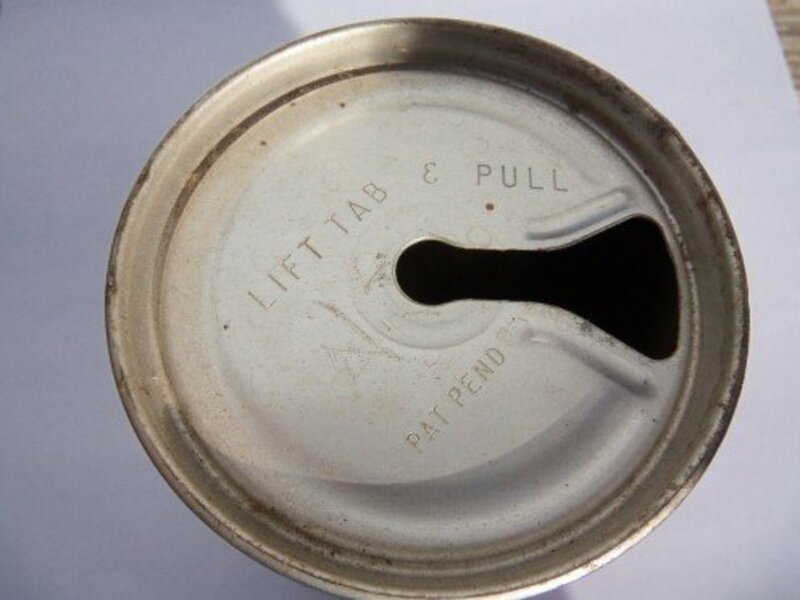 One of the biggest draw backs for the beer can was the lack of a proper lining material for the inside of a can. There had to be some sort of a lining to separate the beer from the metal itself or there would be a chemical reaction beer would result in a bad tasting beer. After many years of research the American Can Company developed "Vinylite", which was a synthetic plastic. The magical church key opener that was needed to open the flat top beer can. In 1934 after many months of coaxing, the American Can Company persuaded Krueger brewing company to try selling their beer in cans. They chose Richmond, Virginia as their test market, and put the beer cans into the stores by January of 1935. The results were good, and by the end of 1935 there were 23 different breweries using the beer can to sell their product. The advantage of selling beer in cans was their compact size and lightness. They could also be filled a lot faster than bottles. But some brewers weren't ready to cast aside their expensive bottling machinery for new, expensive canning lines. 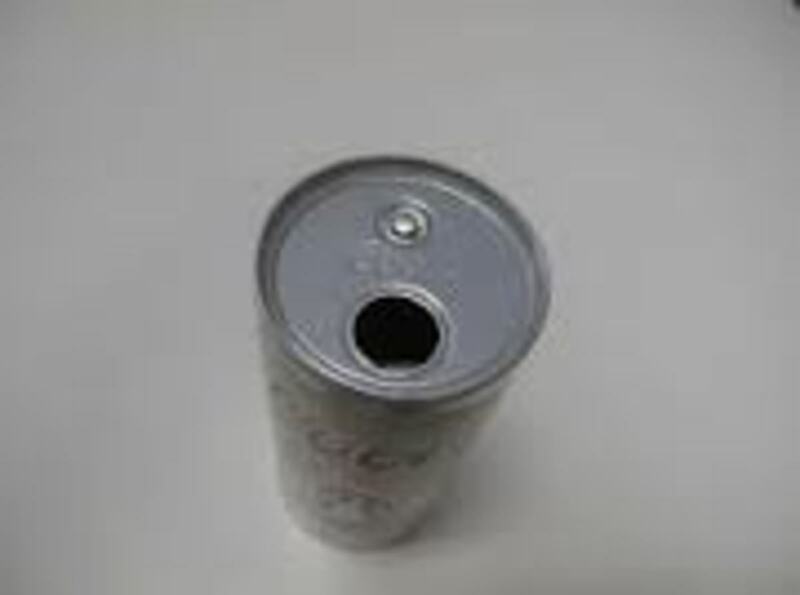 So the Continental Can Company developed what we now call today the "Cone top" can, which could be used on existing bottling lines. The cone top beer cans were made in 12, 26, and 32 ounce sizes. 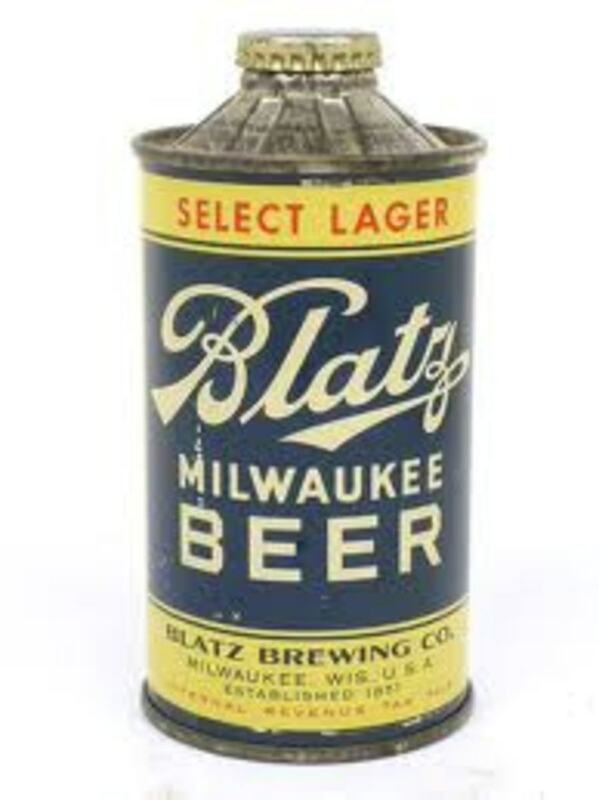 Since the flat top beer can was much more compact, and could be filled much faster most brewers who started off with cone tops changed over to flat top beer cans as soon their machinery needed replacing. By the middle of the 1950s the cone top beer can was no longer in use. The flat top beer can became very popular both with the consumer, and with the beer industry itself. Up to this point the beer can was made completely constructed, and made out of steel. Those little pull tabs ended up all over the place, which included our rivers & streams. As requested a photo of Coors button top can. In 1960 Reynolds Aluminum developed an aluminum flat top for their beer cans. 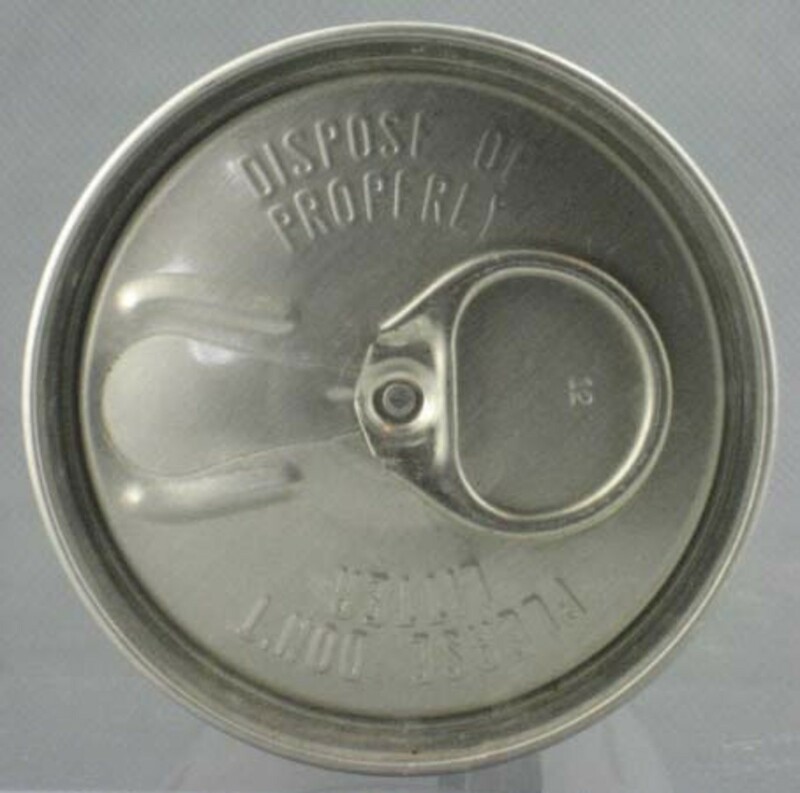 In 1962 the zip top or "Snap top" beer can was marketed. 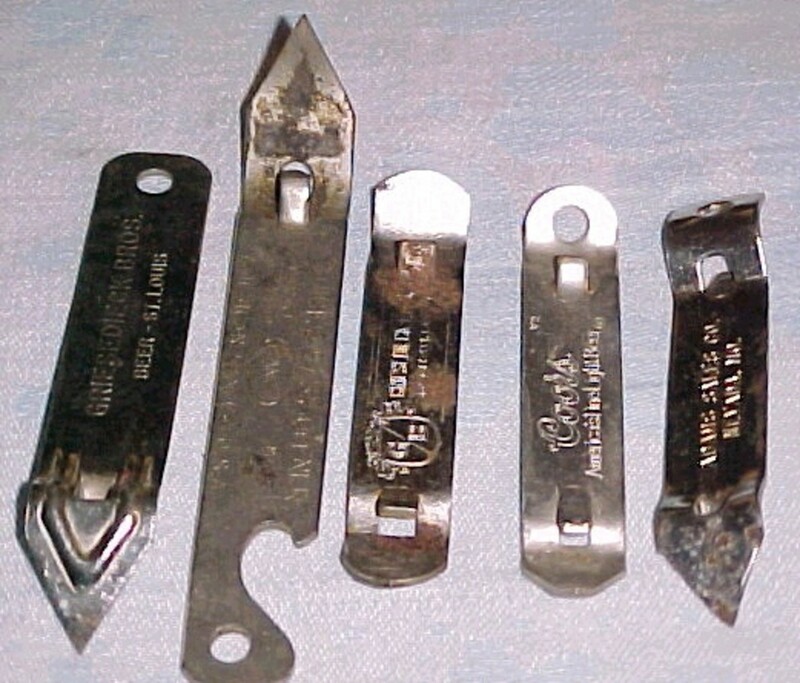 There were a number of problems with these tops, such as cut fingers and cut lips. After much experimenting the pull ring can emerged in 1965. The pull ring can has been almost problem free except for the litter from the tabs, and an occasional swallowed tab from an ecology minded soul who tucked the tab back into the can after pulling it off. So in the early 1970s Coors brewing company was the first brewer to come out with the button top beer can. In 1977 the ecology tab appeared on the market, and that's what we've had ever since. 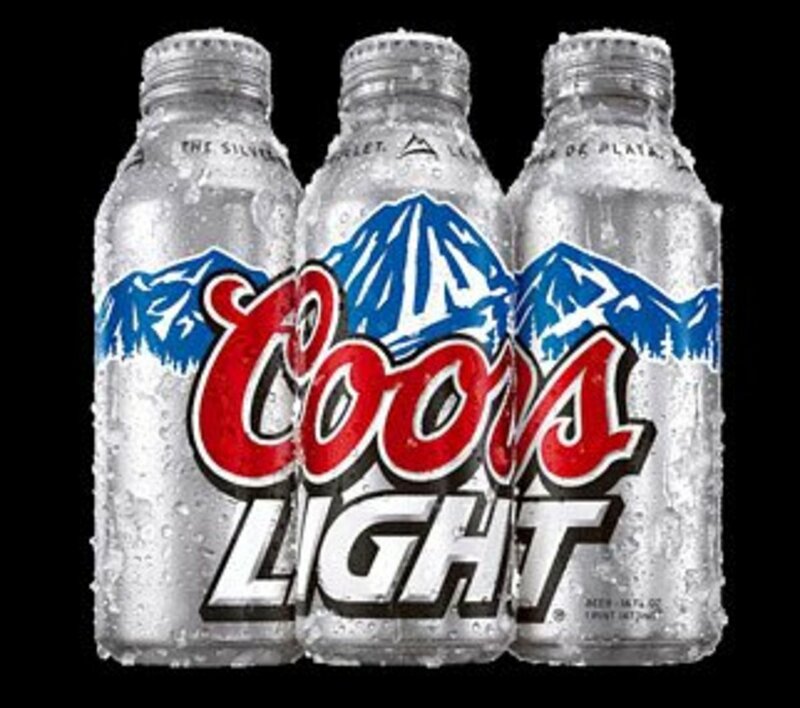 Also in the 1970s the steel beer can became obsolete as the more inexpensive aluminum beer can, which was first developed by Coors in 1959 hit the markets full blast. 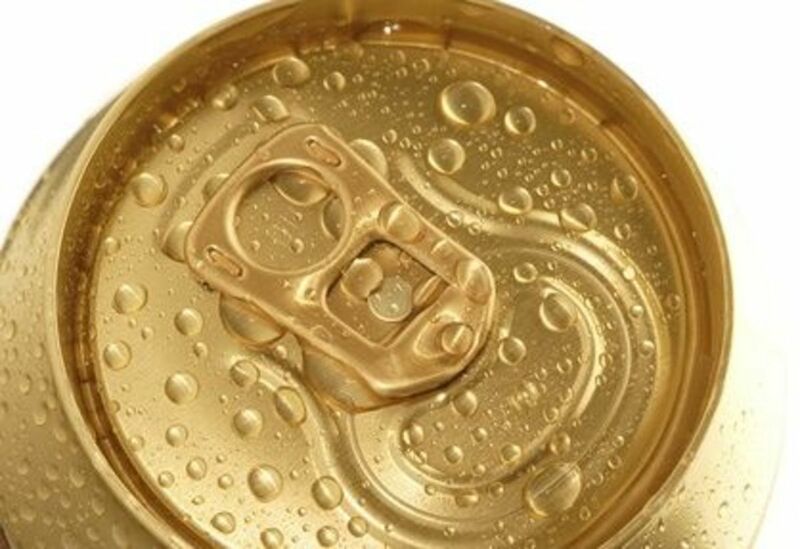 The aluminum beer can was cheaper to produce, lighter weight, and took less time to chill the beer than the steel beer can did. Like the old saying goes what comes around goes around in this world, and this goes as well with the beer industry. In 2013 the reemergence of a modern day flat top beer can is back in the market place. 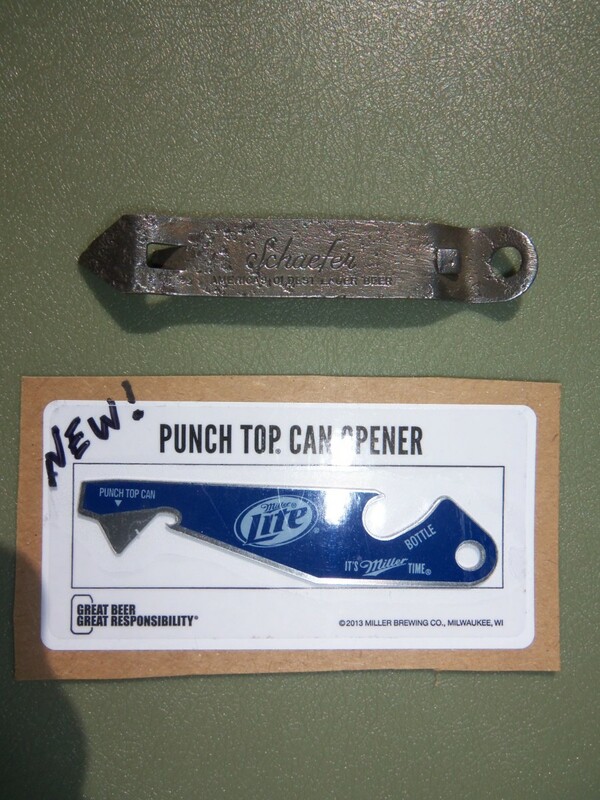 The punch top beer can opener is now included inside of cases of Miller Lite punch top 12 ounce cans. 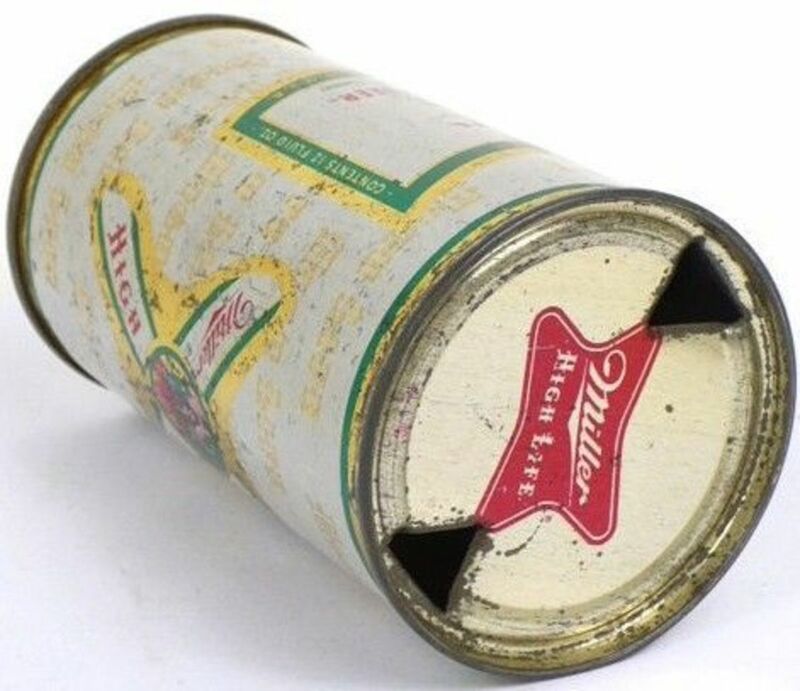 These modern day versions of the flat top beer can still have a modern day ecology tab, but they also have an area where the beer drinker can punch a hole in the top of the can to get a faster beer flow. Some generations in slang term refer to this as shot gunning a beer. Once again what comes around, goes around in this world, and everything eventually in this world comes back around in a full circle. This new century has now seen the introduction of the 16 ounce aluminum pint beer can/bottle. It's been referred to as the "CaBottle", because it's a beer can in the shape of a bottle, just like there was back in the 1930s. 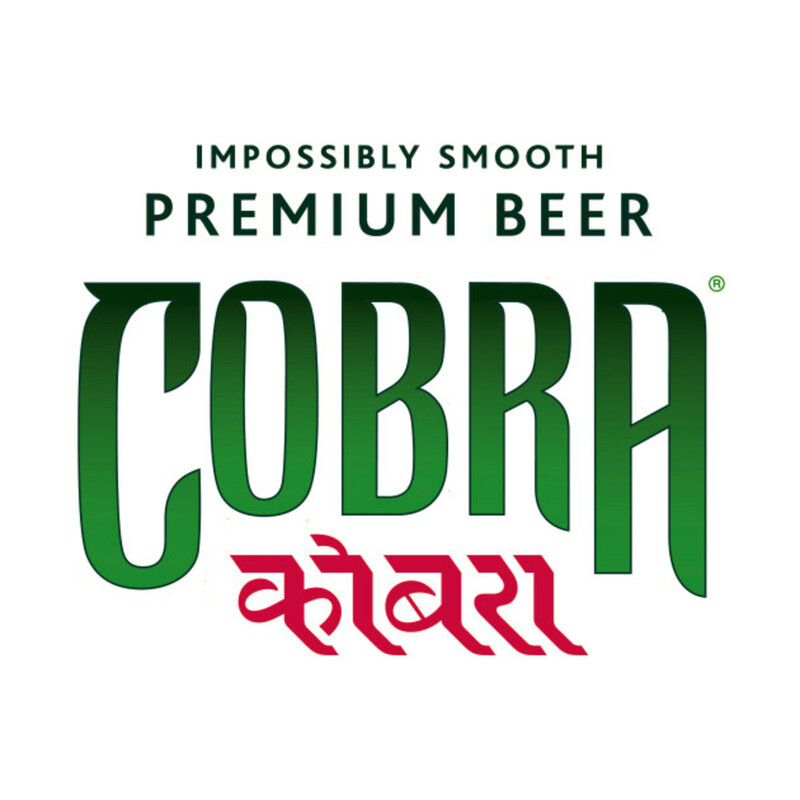 What will these geniuses in the beer industry think of next? Today the beer can cost more than the beer inside. That's why researchers continue to look for a cheaper substitute for the metal beer can. A number of plastic devices been tried over the years, but the same beer doesn't taste anywhere near as good as it does in bottles and cans. Compressed wood with a liner has even been experimented with, but the metal industries are huge and rich, so down the road we can expect to be buying beer in metal cans for some time to come. Going full circle and retro doesn't end with just the modern day can opener or the new age cone top beer can. 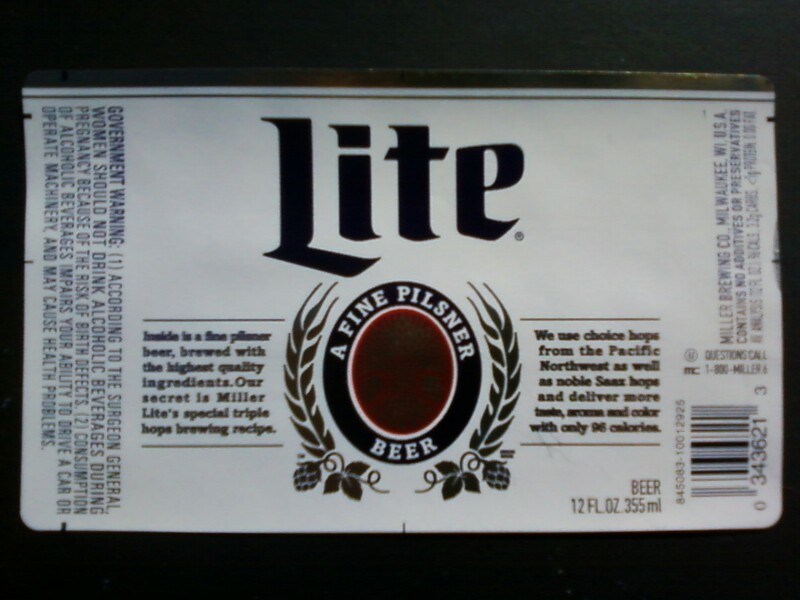 Miller beer has recently decided to go back to it's roots with the original design which was on the very first lite beer cans in the year 1973. 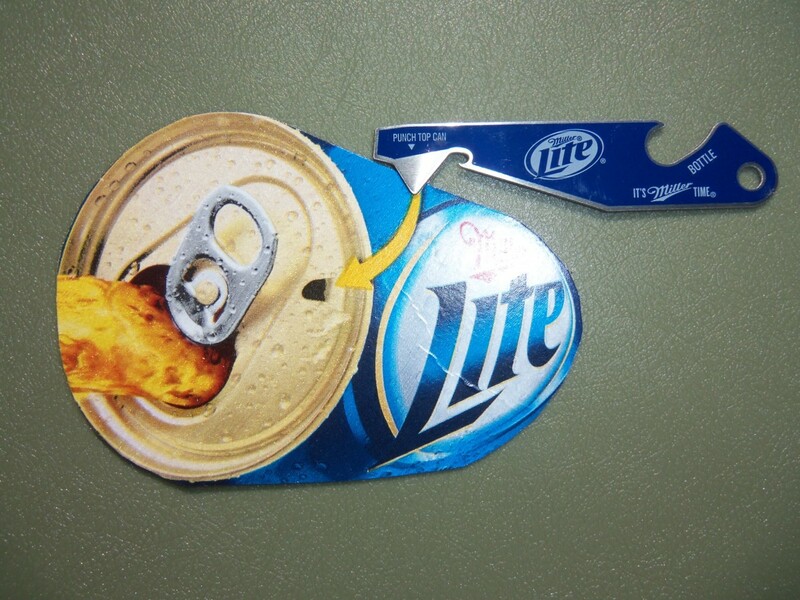 Miller Lite was essentially the first mainstream lite beer, and this is the design that started it all with the light beer craze that swept an over weight nation. Other brewers couldn't use the same spelling for their low calorie beer, so they all just used the traditional spelling for Light beer. This limited edition fine pilsner beer that's now back in the original can still contains the same great taste that was advertised in some of the very first Miller Lite commercials with Bubba Smith. You know the commercials where the argument ensued with a wide variety of celebrities and sports figures taking sides over either great taste or less filling. This heritage look of Miller Lite will certainly bring back some good old memories for some of the seasoned beer drinkers out there. This was a simpler time when all that existed was heavy beer, but thanks to a special brewing process the invention of Miller Lite changed the world of beer forever. 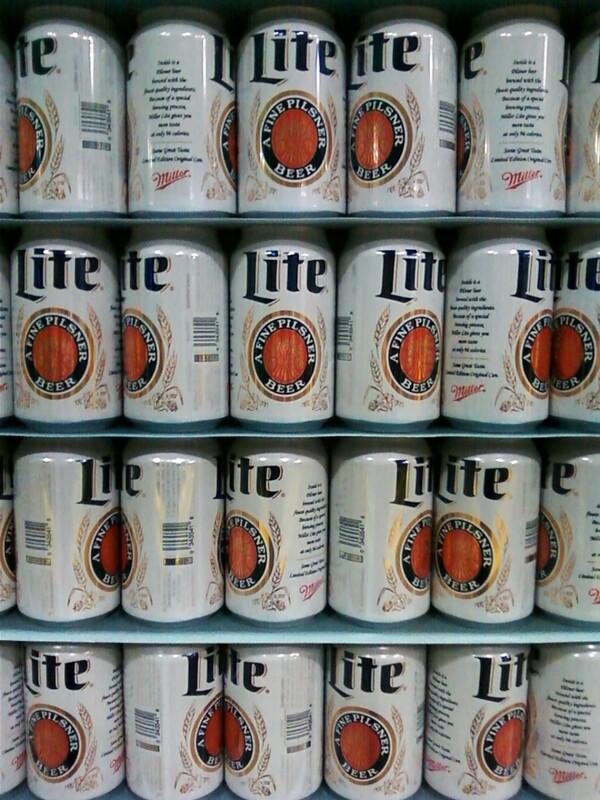 Some people even swear that Miller Lite taste better in the white cans than it does blue cans. Now there is no way that Miller Lite taste better in one color can than it does from out of another color can. 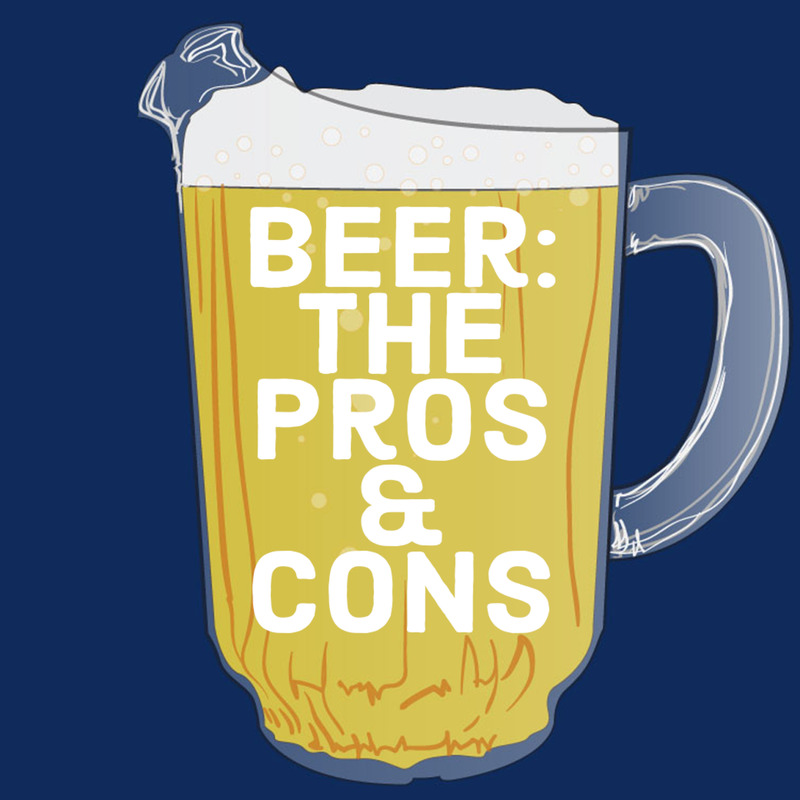 This is simply because both cans, regardless of the color of the paint, are brewed from the same recipe, and come from out of the exact same vat of beer. Therefore the paint job on a can of beer makes absolutely no difference on how the beer inside of the can taste. Go figure. Miller High Life label years from top to bottom and left to right were 1903, 1918,1952, 1971, and 1985. 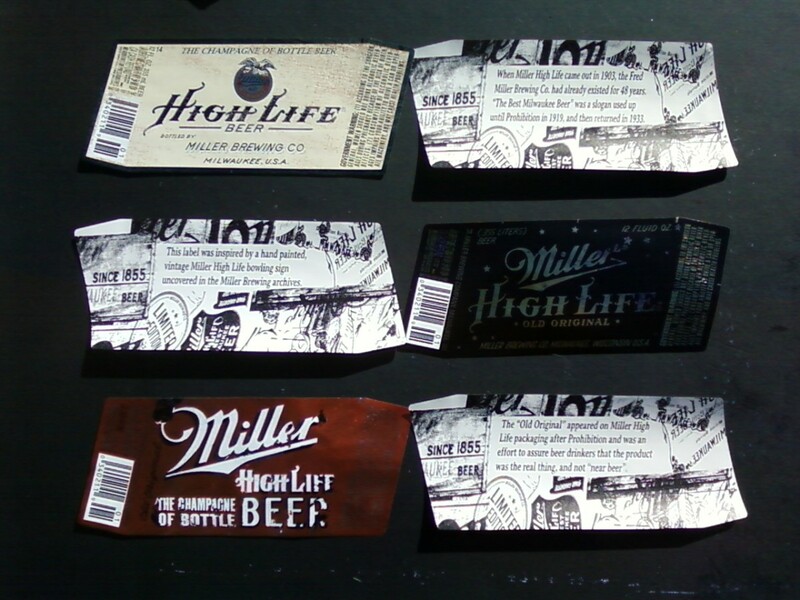 2014 Miller High Life labels dating from 1903 through 1995. 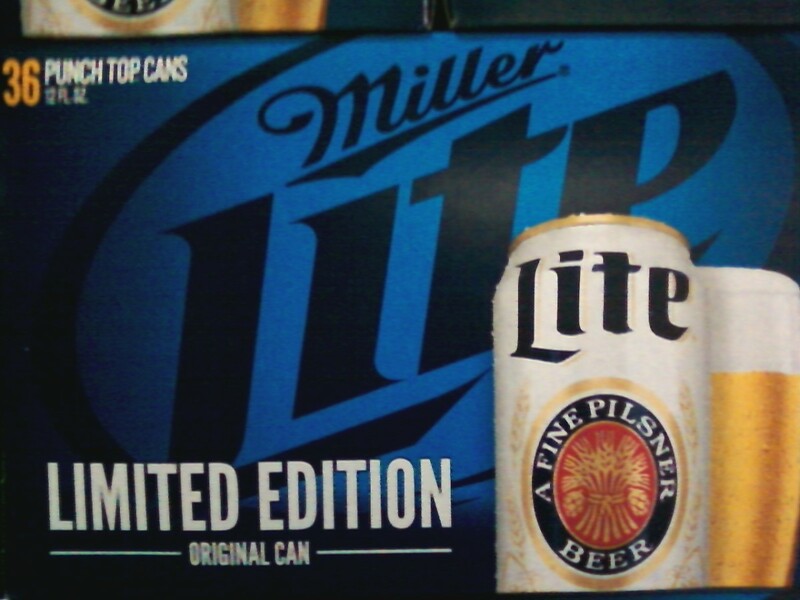 Miller didn't stop or start going retro with just their Lite beer brand. 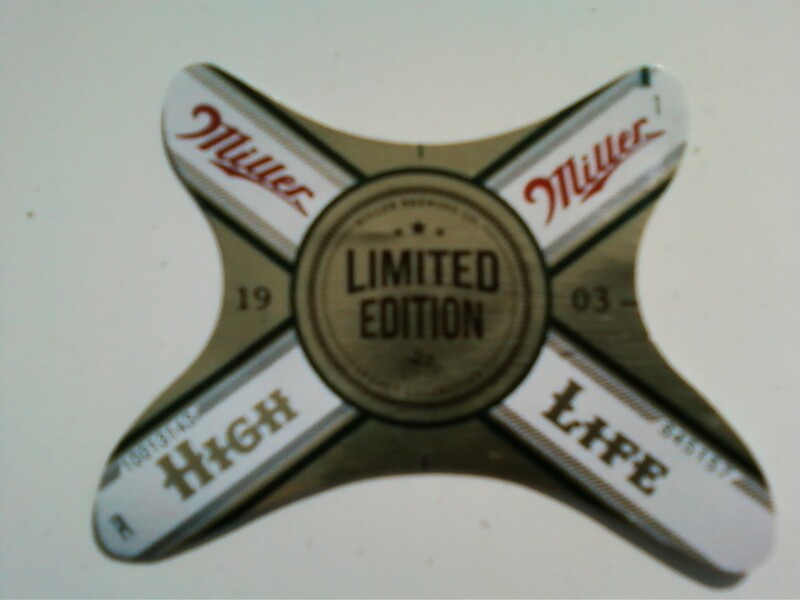 Some time ago on Miller High Life beer they had retro labels glued on their bottles from years past. 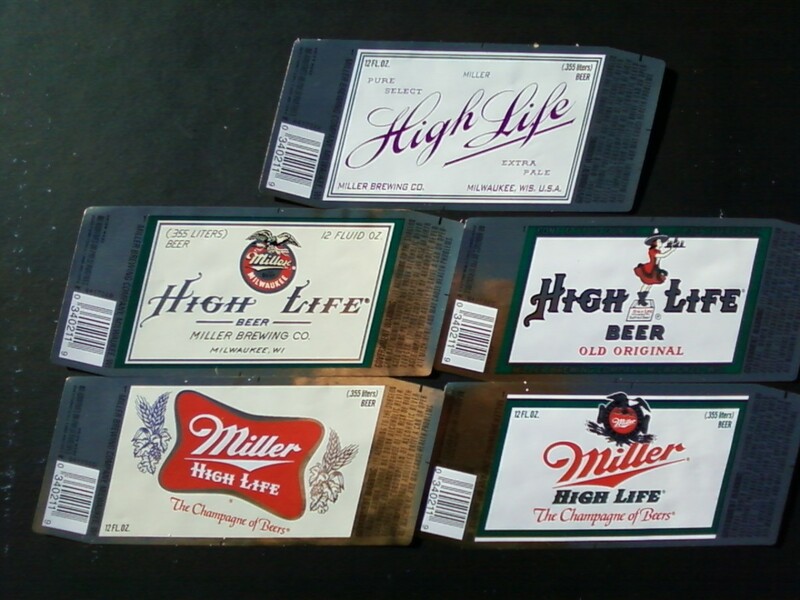 They had reproductions of Miller High Life labels dating back to 1903, 1918, 1952, and 1971. The final label was from the year 1985, which is basically the same label that we see on our High Life bottles today on the store selves. 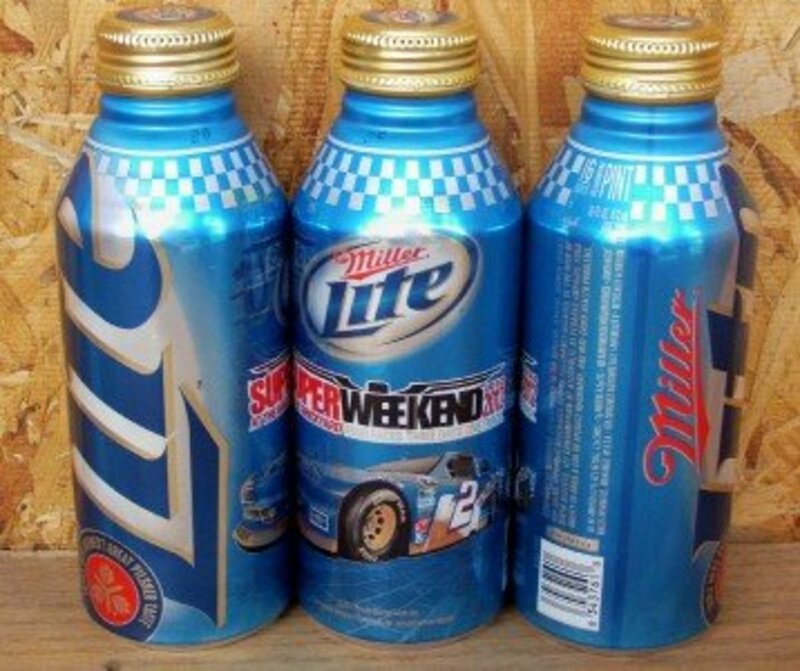 Miller didn't stop there either with going retro with their labels. In 2014 they returned with another blast from the past with 6 different limited edition labels from their legacy collection bottles. These limited edition bottles were inspired by the rich timeless heritage of the "Champagne of Beers". 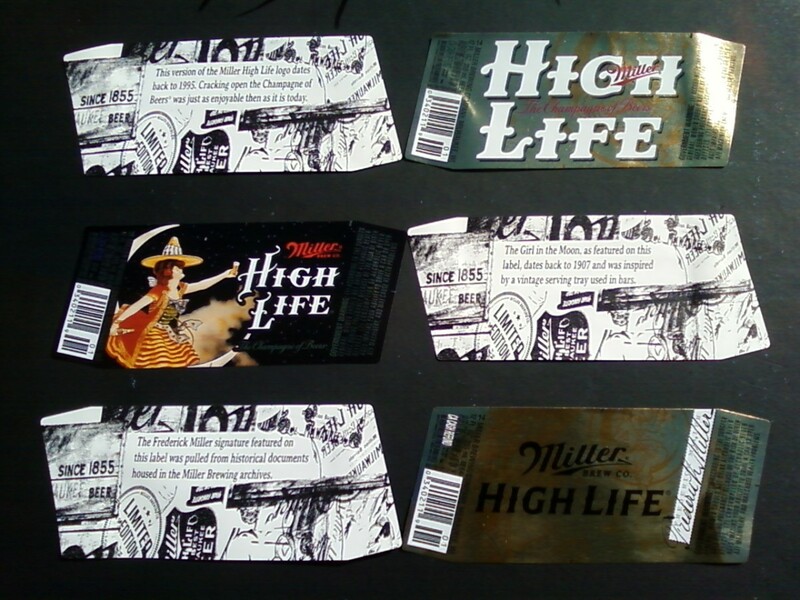 These 6 different unique beer labels celebrated Miller High Life's long history from 1903 though 1995. 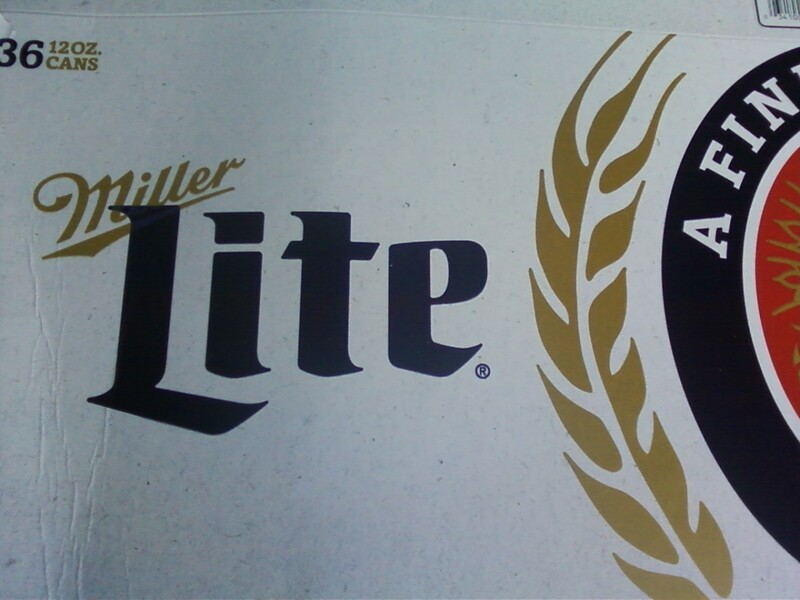 Another interesting fact is the Miller Beer logo was originally designed by Clifford Brooks Stevens, a very famous American industrial designer, who back at the time was called a stylist. His futurist concepts also included Harley Davidson, and the Oscar Meyer wiener mobile to name just a few. Mr. Stevens is also credited with the fact of convincing the Miller Brewing Company to switch from traditional brown bottles to clear bottles. Next because of some newly enacted laws the today's brewers are going to start bottling 32oz and 40oz bottles of beer in plastic bottles. There's also a rumor out there in the beer industry that a "Black" beer bottle is in the works for down the road. 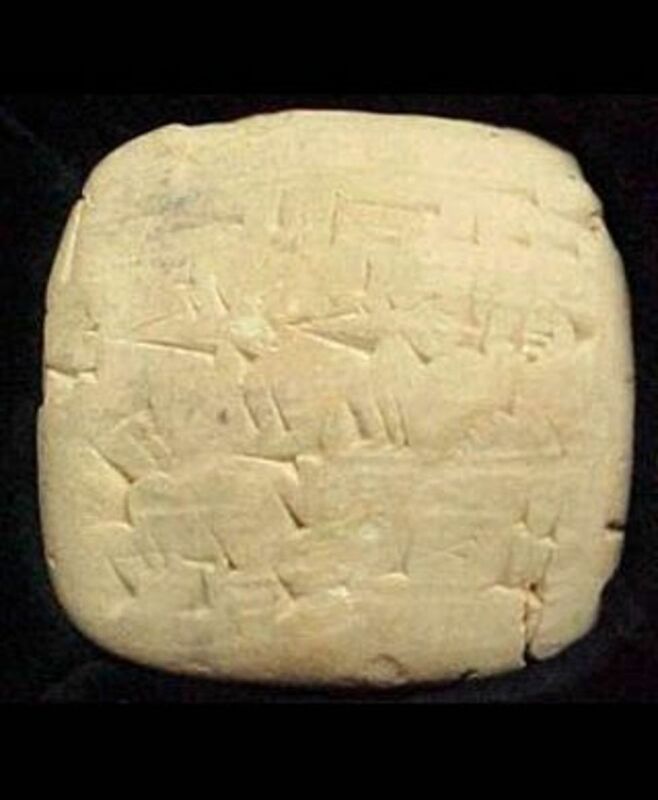 However all of this is another story, and it has nothing to do with the history of the beer can. Do you prefer your beer in a can or a bottle? Doesn't make any difference to me as long as it's cold. Great hub and a most interesting history! The pictures are also amazing! Voted and pinned! Not a beer drinker - can or otherwise, but I found this very interesting! This is a novel Hub page! Congrats on the subject matter, Hole Story. 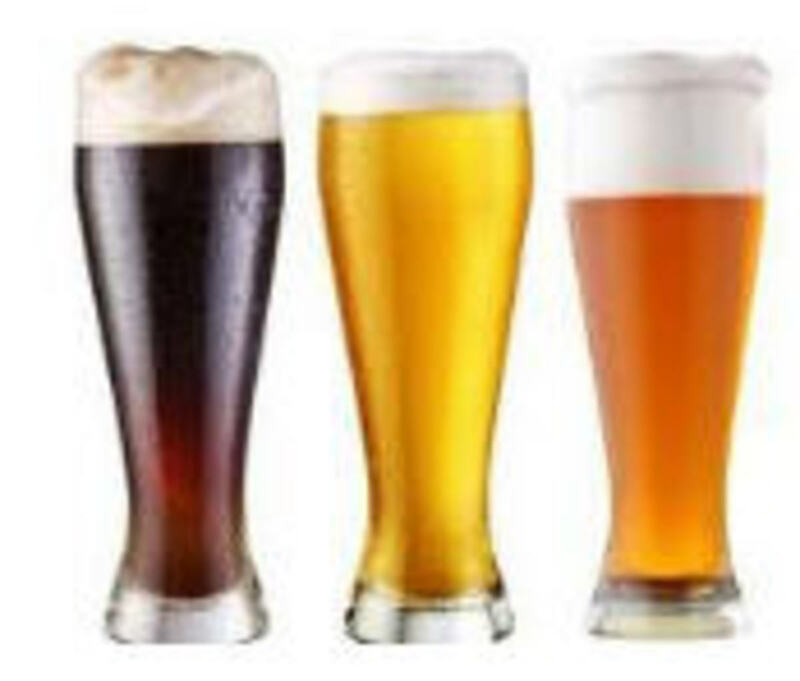 Mind you, beer, ale, lager etc tastes a lot better draught than in bottles or cans. There always seems to be an 'aftertaste' from bottles OR cans. And then there's always WHERE the water comes from for the beer. I tried some Bass bottled under license in Belgium. It tasted bloody awful, and nothing like the Bass that comes from Burton (on Trent)! I've tried quite a few beers and ales in cans AND bottles, in Britain, Austria, on a Belgian ferry from Dover to Ostend. Lager, or Pilsner as you probably like to call it in the US, doesn't suffer too much from either bottling or canning. Bitter or ale can suffer, and again it depends on where the water was drawn. Apparently Burton on Trent, being close to the source, has the best water in Britain (most British brewers tend to be in England, and we've got no end of them). With all these micro-breweries setting up, the favourite containers tend to be barrels as opposed to kegs, whereas the lager brewers here tend to prefer using kegs because they can be 'gassed up' more easily on the pressure pumps. Ale from the barrel has a richer taste. At the same time we have these breweries that produce John Smith's and Tetley's ales in the 'creamflow' kegs that are air pressurised. Doesn't taste too bad, but 'real' ale is still better (and it isn't necessarily tepid, as you Yanks like to think we drink it)! What's really suffering is the licensed trade, with as many as 450 pubs shutting down up and down the country, mostly in England. We have a large influx of Islamic immigrants in Britain these days, some districts of London being almost entirely Moslem. So guess what, the pubs shut down there. There are also many pubs closing down because the brewery chains impose ridiculous rules, the Exchequer's been racking up pub prices (where supermarket prices are about half), and spending money's dropping with the strains on household pockets. It's a great life if you don't weaken! Nice and interesting hub. 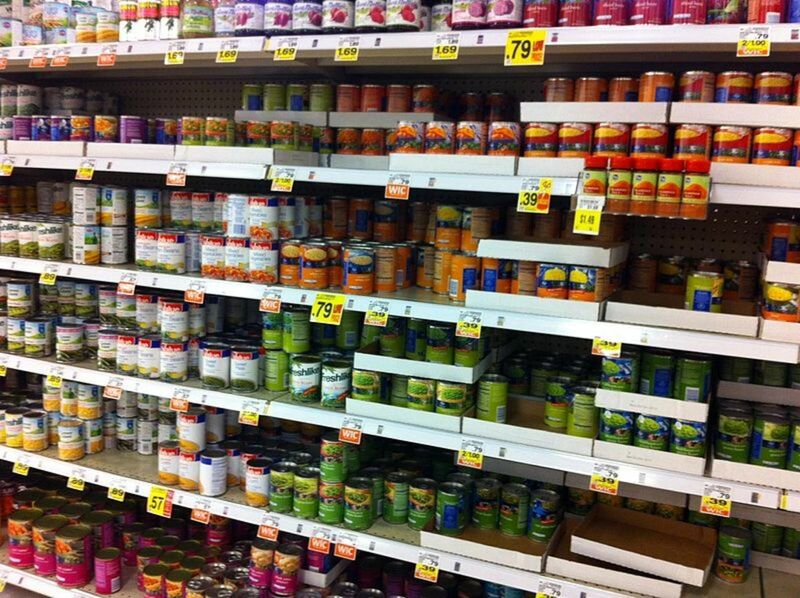 Who knew cans could be so expensive? Very interesting hub! Did you know that there is a Brewery Museum in Brussels? You can go there and test all kinds of beers. One of the time I was in Belgium, I saw "a meter of beer" in the grocery store. Let me explained that .... it was a box a meter long (a little bit more than 3 feet long) with all kinds of cans of different beers. 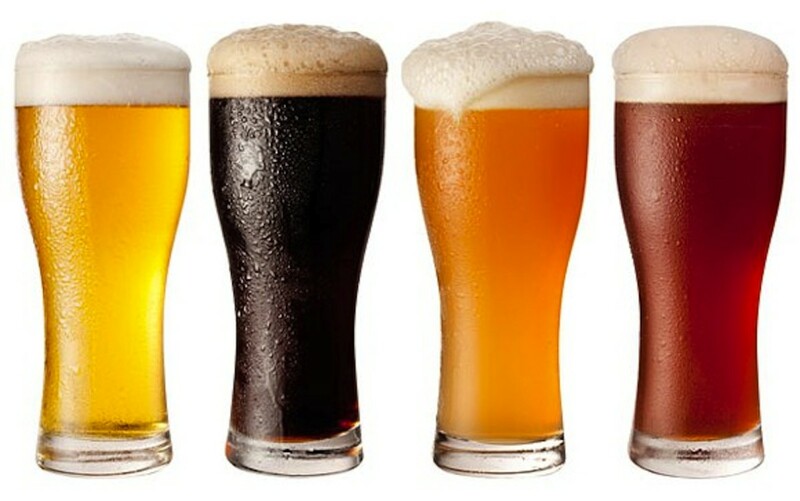 Thanks for sharing those interesting facts about beer! This is such a cool, unique and interesting hub, voted up, more and shared. This was a unique subject that garners great attention. I so enjoyed reading the history of the beer can. It is rather telling how the construction found its way back to the original package theme. Thanks for the feedback, and I've added a photo of a button top beer can for you Eric. 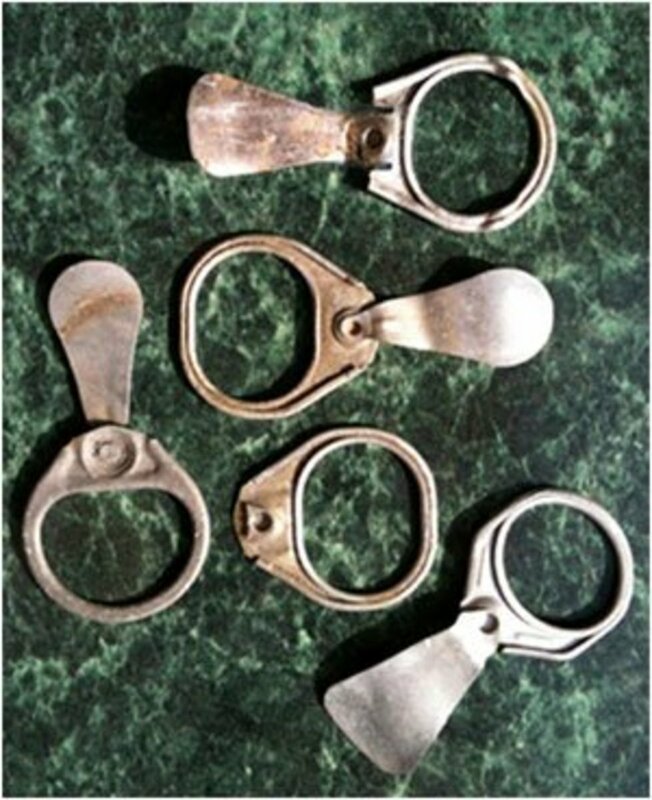 Those church keys are certainly a thing of the past, but the modern day cone top or aluminum pint can is certainly popular with the beer drinkers of today. I suppose I drank more from cans than bottles. I am sure I drank too much of both. Was there a reason for not photo of the push button? Are there still church key operations?